That looks divine. I have picked masses of strawberries from our plants so may have to give this a whirl. I don't think mine will look as amazing as this mind. What a cute idea to decorate a cake in this way.. love it!! Oh my gosh that is so adorable! I love the little dots, it must have taken forever to make them but it looks so worth it! :) The rhubarb filling is making me drool too. Lisa is one lucky girl! 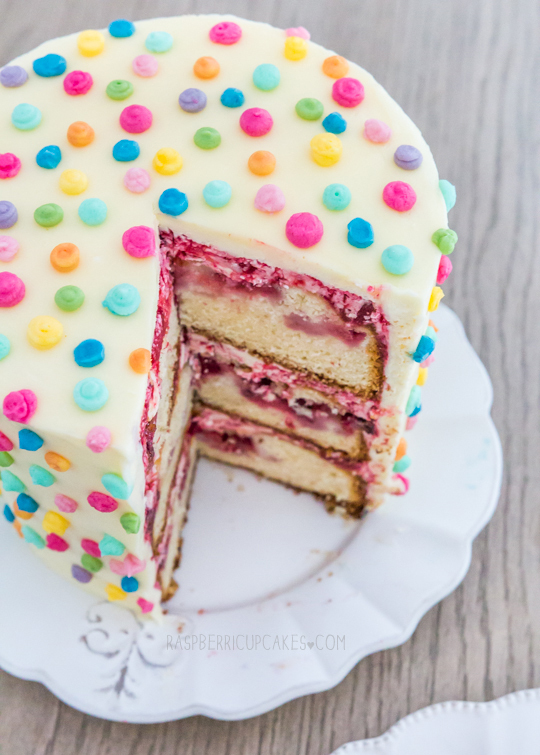 It would be impossible not to smile at this cake. The dots are too cute. I love this idea! I think it would work well for all ages, it's so fun and colourful! I love the combination of rhubarb and strawberries but I've never tried it in a layer cake before. 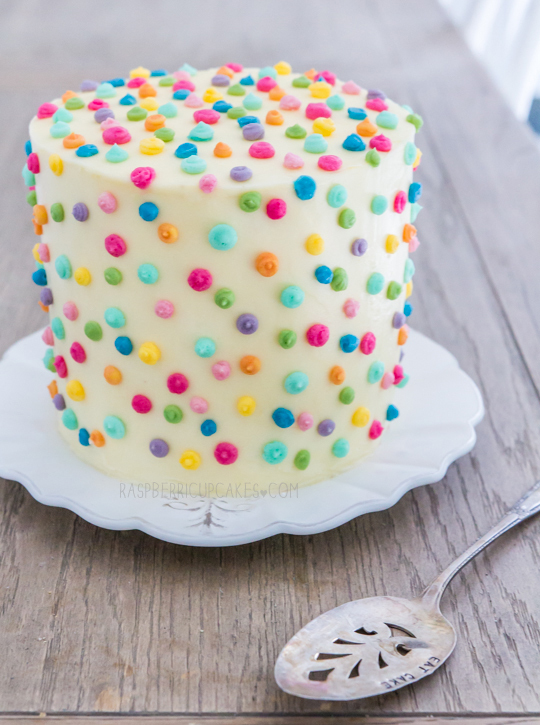 Love the rainbow dots, what a great birthday cake! This is amazing! I came over from Pinterest and thought I'd repin the cuteness but was so overcome that I read the whole post and recipe and pinned a few times. Such a great idea and what a fun birthday cake!! 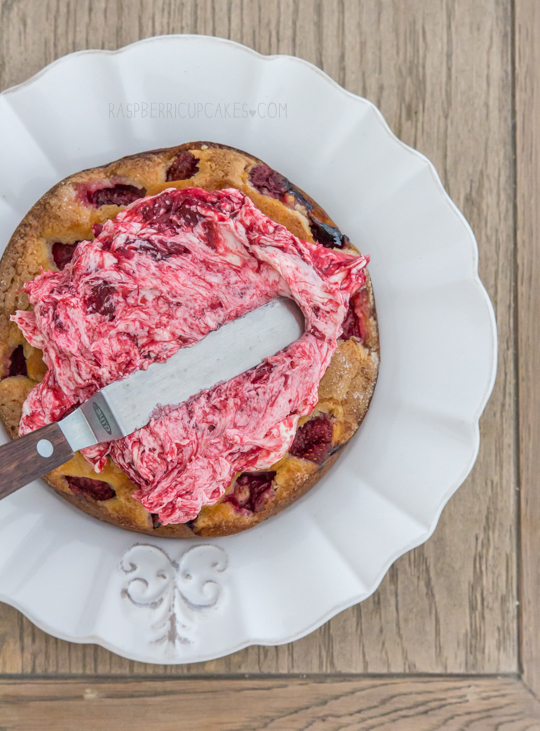 This is so cute, but the strawberries, rhubarb, and tall layers are what really sold me! What a great idea to dot different colors. 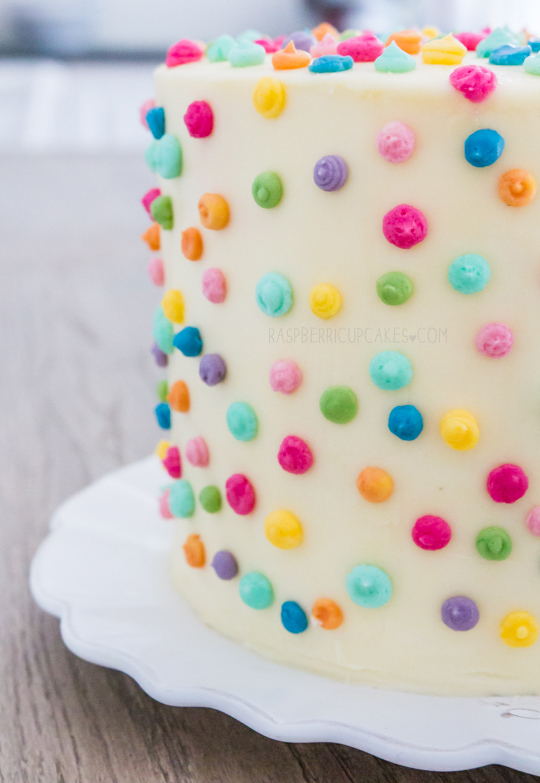 You fear of a moldy pimple looking cake is all too familiar! But it looks fabulous! I love the look of the cake. It's so cute and when you cut inside, you have a pretty and delicious filling. Happy Birthday to Lisa. 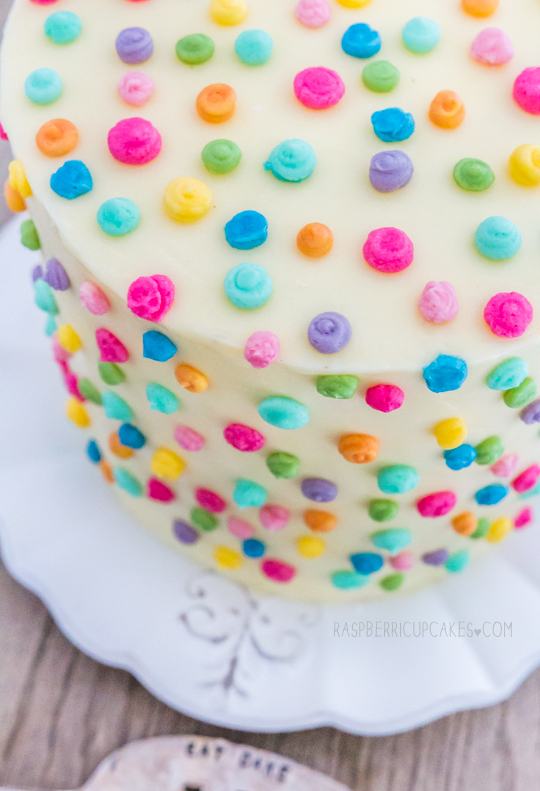 Buttercream rainbow polkadots? Wow! Why didn't I ever think of that! Cake looks amazing Steph, your friend is one lucky lady! This cake is such a stunner!! Awesome idea! So cute and colourful!! And the rhubarb filling looks great with the swirls of red and white :) im sure your friend loved it! yum yum yum! Looks so yummy and I love the decorations. Love this! And that cake is right up my alley! 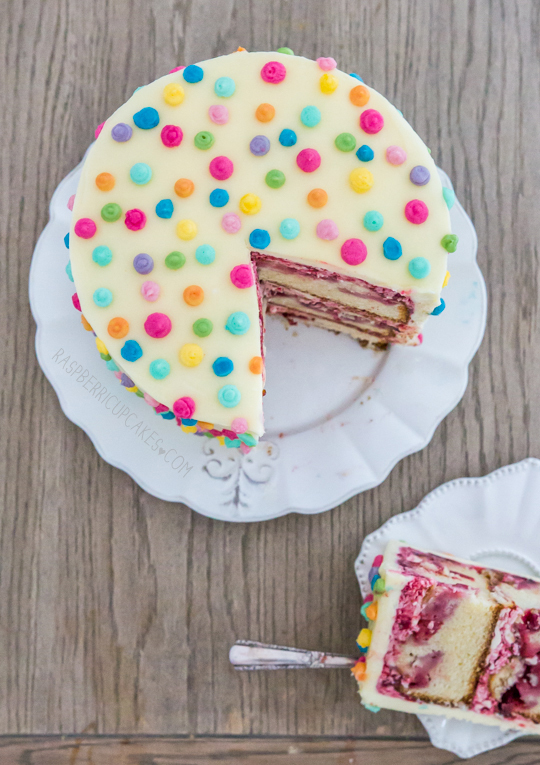 I love the look of this cake and I'm thinking of making it for a 'pink' themed BBQ for breast cancer (different icing though) and i was wondering how long in advanced i could bake the cakes because i understand the strawberry could make it soggy!!?? Hi Kate, you should be able to make these cakes 1-2 days in advance. As long as you keep them in an airtight container in the fridge they should not go soggy. I gave this a try for my baby's first birthday party today and it was awesome and delicious, I would say the hit of the party! Thank you! My dots didn't look as good as yours but it was doable for me and in a complete amateur, as in I haven't baked a cake for about 4 years. I did do a trial though thankfully as I learnt a lot about what I was doing and how to make it work. Highly recommend this!